In 1996, the United States Congress amended the Safe Drinking Water Act requiring water providers to deliver an annual Water Quality Report to their consumers. The report is intended to provide you, the consumer, with information regarding the quality of your drinking water and to illustrate some of the challenges faced in delivering safe drinking water. The Virgin Valley Water District is committed to keeping its consumers informed; you are encouraged to read these reports in their entirety. Informed consumers are more likely to help protect their drinking water supplies and understand the true costs associated with providing the water they depend on. Our water system is required to monitor your drinking water for specific analyses on a regular basis. Results of the regular monitoring are an indicator of whether or not our drinking water meets health standards. Due to a misunderstanding, the District only sampled one sample date during the month of June and did not sample the second sample date during August. Samples for the DBP’s for the month of August have now been completed, returning the District to compliance. There is no health risks associated with the levels of DBP’s in our water. For more information please review this pdf. The Virgin Valley Water District serves drinking water to a population of approximately 17,000 people in Clark County, Nevada. The District relies exclusively on groundwater wells located throughout the District’s service area. 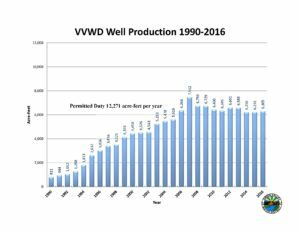 To meet the growth in water demand in the District’s service area, several additional wells have recently been drilled and prepared for operation. Unfortunately, the District’s groundwater contains naturally occurring arsenic at levels ranging from 5 micrograms per liter (5µg/L) to 86 µg/L. Until 2001, the limit on arsenic in drinking water was 50 µg/L arsenic standard. In 2001, the United States Environmental Protection Agency (USEPA) lowered the maximum allowable arsenic level in drinking water to 10 µg/L. Compliance with this new limit was required by January 2006. In order to meet this new limit, the District has installed arsenic treatment systems at many of its wells. The addition of five arsenic treatment systems for a total capacity of 12,100 gpm (17.4 MGD) constitutes a substantial increase in the District’s water treatment activities, not to mention the significant financial commitment required to construct, operate, and maintain these systems. Due to the updates, the arsenic levels are now within EPA limits. Each water source is tested quarterly, annually, or once every three years depending on the constituent for 133 different contaminants as required by State and Federal agencies. Results of those tests can be obtained at the Water District’s website at vvh2o.com or contacting the Water District at 702-346-5731.